Are Josh and Simone Im A Celeb the next jungle couple? I'm A Celeb's Josh and Simone looked at each other. Marriage and babies imminent. We’re talking to you Channel 10. In this case, by ‘Fetch’ we mean Josh Gibson and Simone Holtznagel. 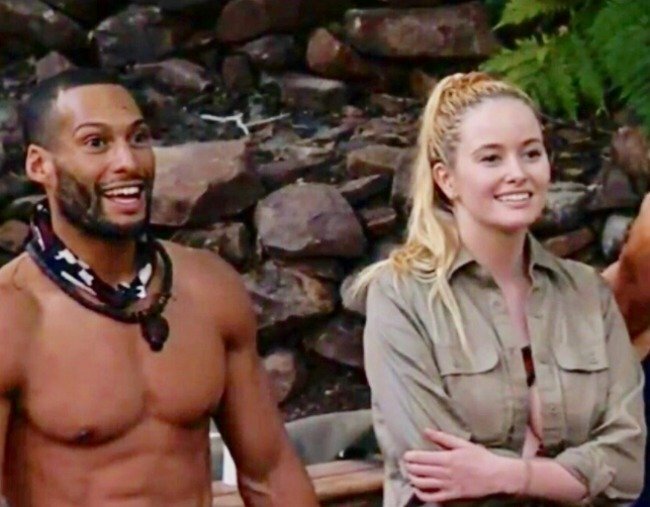 The pair are currently competing on I&apos;m A Celebrity... Get Me Out Of Here and the producers and editors are trying very, VERY hard to convince us that they will be the next Stu and Sophie Romeo and Juliet. At the moment they&apos;re kinda clutching at straws. Or jungle vines. Bring on the Tucker Trial! Josh looks at Simone. MARRIAGE! Simone speaks to Josh. CHILDREN! To be fair, we don&apos;t blame them. As a retired AFL footballer and an international model, not to mention the two youngest contestants in there, they would certainly make a highly Instagrammable couple. And while it&apos;s still very, VERY early days... viewers aren&apos;t exactly against the idea of the two as a jungle king and queen. Even Simone&apos;s friends running her Twitter account in her absence are rooting for it, holding a poll. What do you guys think, Moan and @joshgibson06.. In all honestly, so are we. I mean... it worked for Katie Price and Peter Andre* didn&apos;t it? *For a time, at least.